Our Jakarta cruise port guide gives you information about the docking location, cruise dock, transportation options and much more! Welcome to the Tanjung Priok – Jakarta cruise port guide. Tanjung Priok is the sea port that has served Jakarta for the last five centuries. Jakarta is the capital city of Indonesia. It is situated on the largest of all 17.000 islands: Java. Jakarta is rowdy, busy and perhaps the most intense city of Asia. 11 million people make up the 13th most populous city in the world. It is the economic, cultural and political centre to the islands of Indonesia. A city that displays sheer contrasts. It is where the big business districts meet local poverty. Where Big malls stand next to the traditional Pasar markets of Indonesia. A city that never sleeps and where traffic is the challenge of the day. When you are planning your day ashore in Jakarta be sure to plan you are out of the city before 3 pm as traffic can become incredible chaotic after that. Rely on the opinion of your driver and tour guide when it comes to traffic and timing. 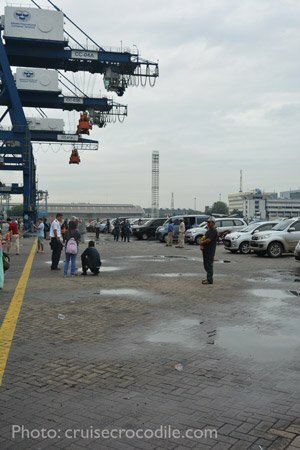 This is the industrial port of Tanjung Priok – Jakarta, where cruise ships will dock when calling into Jakarta. There are hardly any facilities on the dock. For this port we recommend to pre-arrange transportation. Tanjung Priok is the port to serve the city of Jakarta. Cruise ships can dock at several places in Tanjung Priok, but they are all close to each other. See map above for the different cruise docking options in Tanjung Priok. The city centre of Jakarta is about 13 km away from your cruise dock. When planning your day keep in mind there are 2 main areas you want to visit; Central Jakarta and Sunda Kelapa. South of the city of Jakarta you can also find Taman Mini Indonesia Indah, displaying the entire archipelagos architecture and history in 1 park. Most cruise liners will offer a shuttle service into port. Check with the front office on board what will be the case for your voyage and where the drop off location will be. Take into account the drop off point might not be in the city centre. The official taxis of Jakarta are the blue bird taxis. These generally do not come to the pier, because they are not permitted to come into the port. However, there might be some official taxis at the exit of the port, which is about 20 minutes walk from the pier depending on where you dock. Sometimes, in the early morning, a few old employees of the cruise line are able to get into the port. They often offer their freelance taxi services for a day. Negotiate a price before you step into the taxi. Take into account it costs about 120 US dollar for the entire day. There is public transport available near the port, but this is still about 30 minutes walk from the dock. Outside the port you will find a bus service. This way of transportation doesn’t come recommended, since the system is complicated, especially to a foreigner. Whatever you do in Jakarta, always be mindful of the traffic in the city. Take into account most of the city will become a traffic jam after 3 pm. Therefore plan your day ahead of what you would like to do to avoid not getting back on time. If you have a driver for the day rely on his experience and judgement with the traffic in town. The most important building left in Batavia is this one. It it the Taman Fatahillah or city hall from 1710. It was the official seat of the Governor General of the Dutch East India Company. 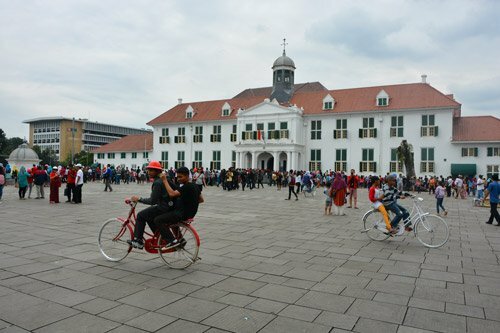 It is a prominent reminder of the Dutch presence in Indonesia. Visit the city hall and surrounding area to get a sense of what this colonised Indonesia was about. Visit the China Town, also known as Glodok, area of Jakarta and get acquainted with the Chinese culture in Indonesia. A great way of doing this is by visiting the Chinese temples. Each temple is different. They each have with different purposes and different traditions to honour. In Glodok you will also find lots of local markets. This is a cafe on the main square of the old Dutch part, Batavia. Go in and step back in time in the classy cafe. The nearest mall to you will be the Artha Gading Mall. This is about half an hour drive from port. Find all kind of different shops, entertainment, wi-fi and food courts here. The puppet museum of Jakarta is a must see in town. Art is incredibly important to the people of Indonesia. The ancient art of Wayang is a form a story telling that originated on Java about a 1000 year ago. The museum will give you a sense of what it takes to create a traditional Javanese Puppit Show. The instruments that you need, the labor involved in creating a puppet and the different characters that they have. Cruise ships dock at the port of Tanjung Priok when visiting Jakarta. Tanjung Priok is a gigantic port where your ship can dock at several locations. Read all about the dock facilities and transportation options in the full Jakarta cruise port guide. Sunda Kelapa is the historic port of Jakarta. This is where you will find the famous fleet of Pinishi Schooners. They are traditional 2 masted wooden sailing ship and still considered the world’s last wind-powered sailing fleet. They can carry many different kind of products. The majority carries cement. Most ships have a fixed connections between Jakarta and Makassar. Visit the harbour to get a glance of the ships and perhaps see if you can step on board to check out life on such a vessel. A small tip would be appreciated in this case.